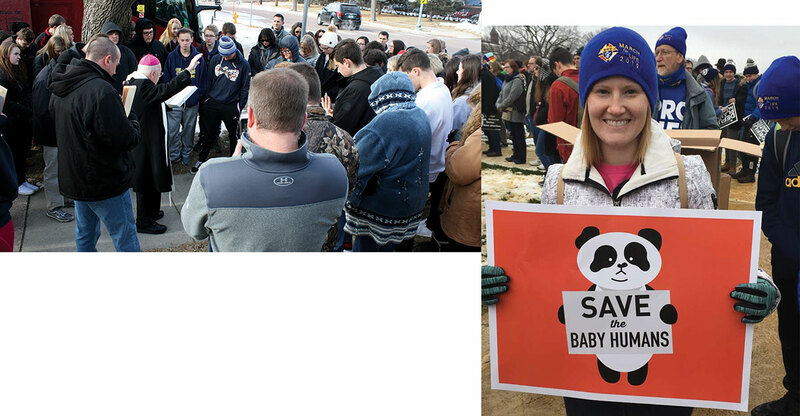 Bishop Paul J. Swain blessed pilgrims from the diocese (left picture) as they prepared to head out to attend this year’s March for Life event on the National Mall in Washington, D.C.
Two bus loads from the Diocese of Sioux Falls carried 99 pilgrims on the journey. The group departed on January 16 and returned to the diocese on January 20. This was the 46th annual March for Life. This was the seventh year the Diocese of Sioux Falls sent busloads of pilgrims to attend. Amber Smith, Immaculate Conception Parish, Watertown, was one of the pilgrims from the diocese (right picture).